Thank you for bringing that up. That thread was very informative. I have a #75 drill, so will look for a #78. Did you drill by hand or use a motorized drill? as suggested I used a #78 drill in my Dremel motoflex to predrill the spike holes. It worked much better, no bent spikes. I tried a few different things to test spiking the micro spikes. First I wanted to see if I could figure out a way to spike without predrilling, which I did get pretty good at it but I found that when the spike "broke through" I had so much pressure that my spiking pliars would hit the tie and I would make dents next to each spike. the dents looked to consistant and I didn't like them. I was able to brace my hand more but it got to the point that I felt long spiking sessions would give me hand cramps, and since I plan on four spikes for every tie I wanted a different way. Second was to predrill the holes and just push in the spikes. The spikes went in easy and straight. The spikes are actually small flat wire bent to look like a spike, they measure about 0.10 x 0.20, I used the #78 bit which is fine for the width of the spike but too big for the 0.10 thick side. After pushing in some spikes I felt the rail seemed a little loose to the ties. the last method I tried was to predrill the holes and have a little puddle of thin ACC next to me. I dipped each spike in the thin ACC just before I drove it home. I found that I had to move in a somewhat quick two step process to drive the spike, a small needle nose pliars was used, first to place the spike in the hole and drive it 3/4 of the way in, then swiftly pushing the head in the rest of the way with the closed pliars. If more adjustment was needed I used a small screwdriver to push the spike tight. After I got a long stretch done this way it seemed like it will hold good. After the scenery glue is applied that will grip the rail even more. Picking up the tiny spikes was a bit frustrating. I magnetized my pliars and spread out a small pile of spikes and this helped a lot. I could quickly pick up a single spike, pull it off with my left hand, regrip it with the pliars, dip in glue, and drive in in. Once I got going it went pretty fast. My wife said she would go crosseyed. I have to come up with a way to fix all the oversized holes from the larger spikes if I choose to redo them, which I want to. 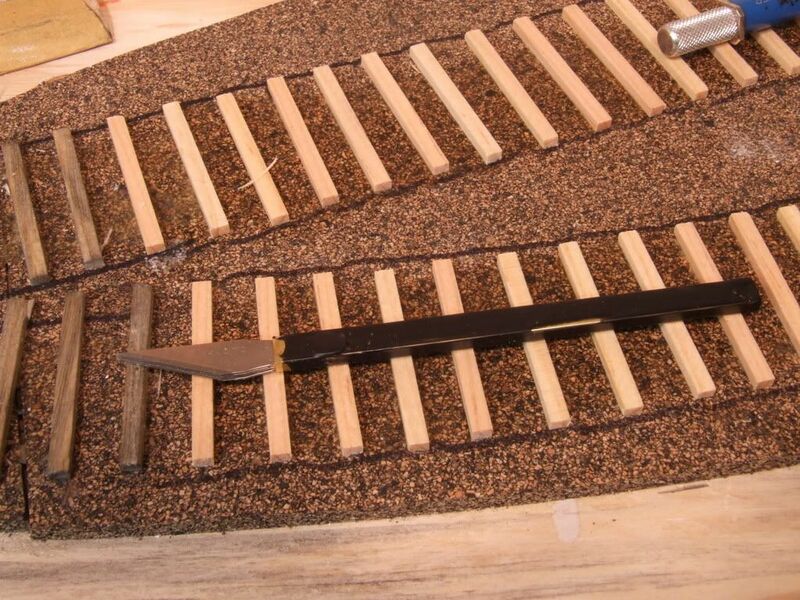 I will continue to use the oversized spikes on the hidden tracks and tracks that are going to be buried in the dirt, they are easier and faster to install, and if the spikes won't show there is no reason to go through the trouble of the small spikes. here is my section of replaced of near scale spikes. I left some of the spikes I was using before in one tie for comparison, they will be covered by a dirt road. Jeff that is some really nice looking track work!! VERY realistic. Keep up the good work. The track is very nice, Jeff. The new spikes seriously add to the realism. The improvement is tremendous! Will you also weather the spikes so that they match the rust of the rail? I will also have a problem with filling all the holes left behind by the monster spikes I used. As soon as I get my microspikes, I will pull up the old spikes from the handlaid spur. I am going to try to weather the spike heads when I get everything set and I don't have to touch them anymore. My idea for filling the larger holes is to use ACC gel and just weather the spots to hide the hole or use the same stuff you would use to fill the holes in wood trim, it comes in lots of colors and maybe I can find a match. Those micro spikes do look a lot better. Did you break any bits drilling the holes in the ties? No broken bits, the pine is really easy to drill, drilling went really fast and easy. I need some help. When I laid out the track plan for this area I was going to build a model of the Mann's Creek Ry's stone engine house to go here. The spot for the engine house is right up front, chest level, perfect for detailing to the max because it will be easy to see every inch and angle of the structure. here is the situation, the Mann's Creek engine house was really nothing more than a stone shed, dirt floor and very little interior detail. I have been considering freelancing a structure of wood with lots of detail clutter inside and out. I would like a wood floor and service pits and all the work benches, machines, and tools, maybe even a structure that has some strange additions that look a little questionalble. I have been also considering some different structure shapes other than the classic two stall gable roof structure. I had considered a flat roof structure with the roof sloping toward the back and windows above the locomotive doors to provide light. Or a structure with the gable roof sideways. I even thought that a single stall house with one track running along the outside wall for storage of stuff. I am thinking that this prime location is a really nice spot to let the juices flow and do something really creative. Have you considered the Cranberry (ETWNC) enginehouse? Jeff, how about their newer wooden enginehouse that was near their machineshop? still considering what to do with the engine house, I have time so I am just going to let ideas stew for a while. I thought I would share my tool for making wood grain. I don't like using a razor saw to make grain because I feel it is too big and it makes V shaped grain, I also don't like how fuzzy it makes the wood. I took a brass rectangle tube and inserted four Xacto blades into it. the blades had to have the height of their base ground down a little which I did just enough to be able to force the blade into the brass and not need any thing to hold it in other than the tight fit. I coated the brass with liquid tape to give it a little grip. to make the grain I just make many light and quick strokes on the wood, much like scratching it, a few long strokes will make long grain patterns. I also found that if I hold the tool perpendicular to the tie yet off to the side at 45 degrees and make a bunch of strokes, then switch the angle to 45 degrees the other way the wood will sliver and lift out sections and make a much ruffer grain. What I really like is there is no fuzz and it does not distort the wood. I use a single xacto blade to pulled backwards to make deep splits and to pull out the ends of the ties or scratch out the middle of the tie to simulate tie rot. 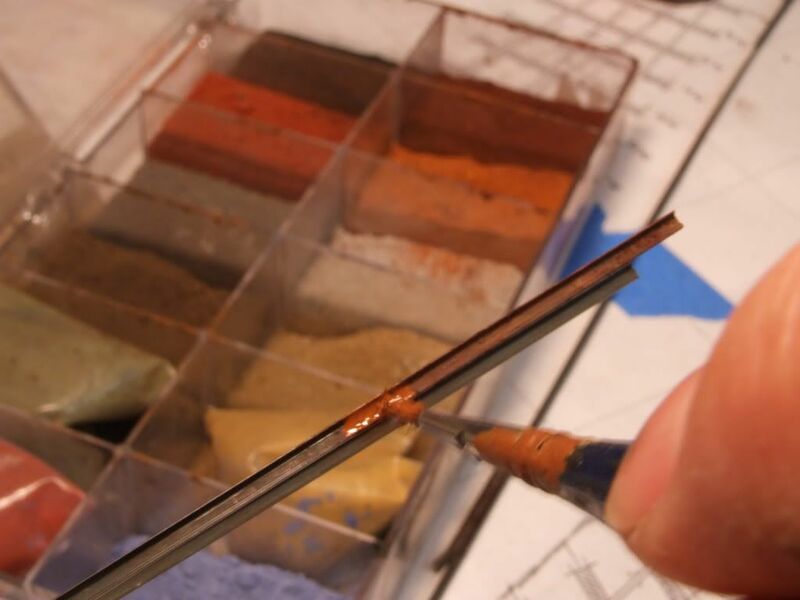 to weather the rail I use Polly Scale Rust color right out of the bottle, an old round brush, and some Bragdon weathering powder. I brush on the rust paint on the side of the rail for about 3", it has to be a pretty heavy coat. While the rust is still wet I pick up some of teh weathering powder and splotch it into the wet paint, the paint will change color to a mix of the rust and the weathering powder and it will get a little thicker, almost paste like in some places. Still working in that three inches of paint while it is wet I poke at it with the same brush to get some rust texture, I will even pick up more powerder, sometimes the same color and sometimes one of the other colors. the paint will dry pretty quick to the point that it can't be worked anymore and at that point I pick up an old larger brush and just poke at the section of paint to push down the crumbs of powder that will form, I may even pick up a little more powder with the big brush to stick in on the last few spots of wet paint (if there is any). I also use the larger brush to thin away the thick paint around the NBW details around my turnouts because the thick paint can cover detail a little bit. the color I use the most of for my rail has been the dark rust for older rusted rail and the light rust for new rust, again mixing the two will make some nice color changes, add a little new rust on some old and vice versa. For really old rust I have been using some of the brown powder and the black. for rails that have been around mud use the lighter brown. To make grease build up use Polly Scale Oilly Black and the dark brown and black powder to make a nice cake that can be built up in places, I use this on the faces of my freight car wheels. I've just read your thread from the beginning. I'm amazed at your progress over the past few months and really appreciated the time you are taking to show techniques and give us an insight into your thinking. As to the engine house, I come down on the side of a design that will allow you to add lots of interior and exterior details. 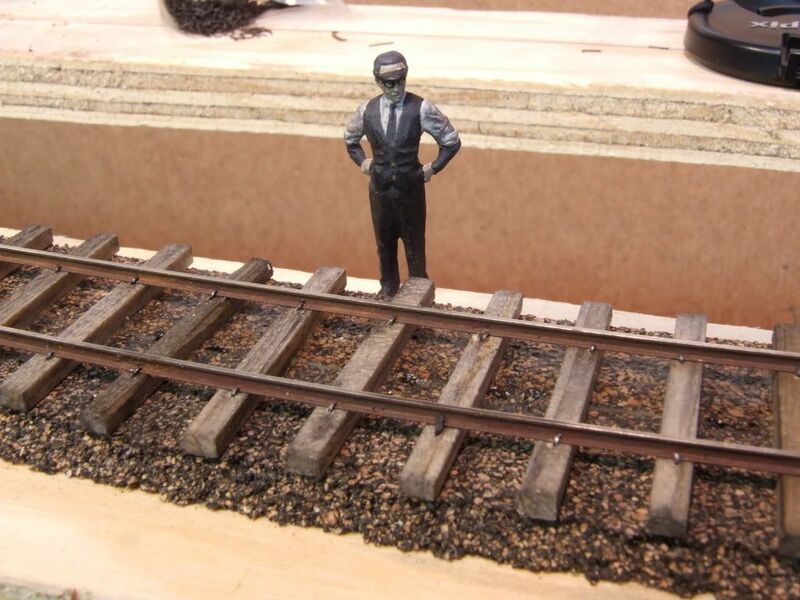 This will be one of a handful of 'signature' structures on your layout. I wouldn't worry about deviating away from the MC engine house - just make it plausible for a logging/mining railroad. Nice progress Jeff, you have the patience of a saint drilling all those holes for the micro spikes. Well worth the effort though, they look heck of alot better than the small spikes. Your trackwork is going to be outstanding as usual. Thanks too for the insight into aging the ties and rail, again all the effort will pay off in the detail. Awaiting more on the SCRy! 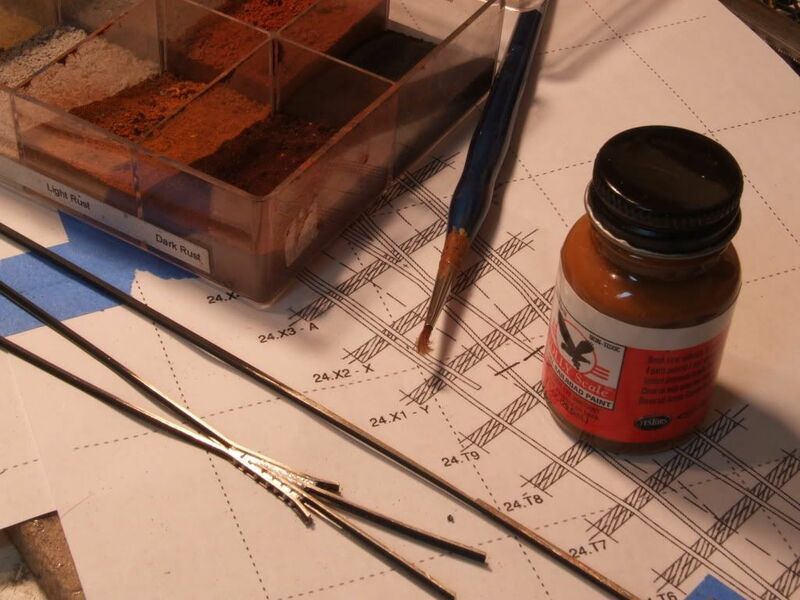 Are you building "solid" frogs at the bench? The drawing in the photo looks like it shows where to cut gaps in the point rails. Are you going to do that after the frog is installed? I guess if your throw rod is not gapped, the point rails would not have to be either. Just wondering ... all my frogs are gapped on all sides, and I got away from solid frogs on my current layout. 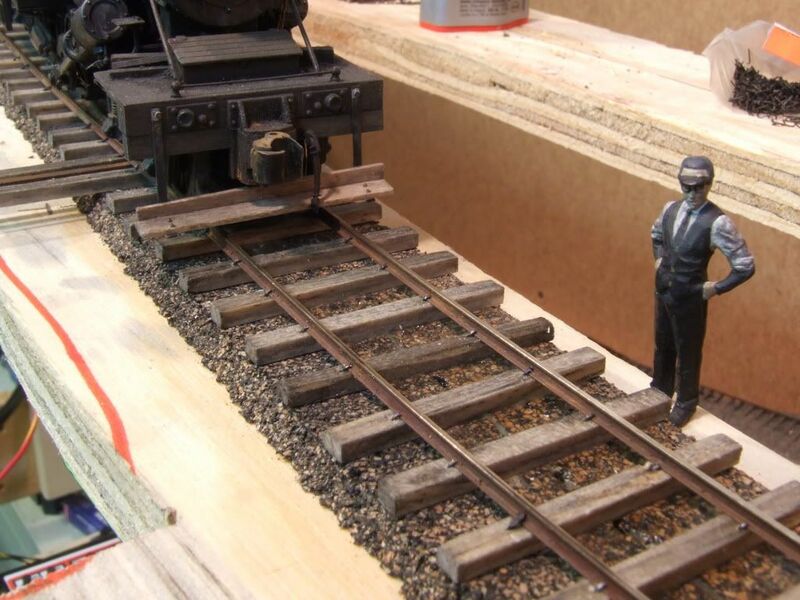 Excellent job weathering the ties and rail.